Corporate events or parties have an unfortunate tendency to be dry and boring. Whether it’s a holiday party, or a trade show, people can find it hard to lighten up when they know their boss or their clients are watching. Even in the more casual world of San Francisco tech companies, or Napa wineries, people can still feel a little intimidated or inhibited. Which is why a photobooth is a great way to insure that your next event will be success. 1- Photobooths bring the fun. It becomes nearly impossible to take your boss seriously when she’s wearing a hat that looks like a turkey. Our photobooths and all the fun props that we bring, get everyone to let their hair down and start acting silly. It’s a great icebreaker, and a great way for people from different departments to get to know each other. 2- Photobooths promote your brand. If you are at a trade show, or have prospective clients at the event, even better. Our graphics team customizes your prints with your logo and party theme. When a party guest from another company puts their funny photo up on the office fridge, or pins it to their cubicle, you get priceless branding. 3- Photobooths draw in potential clients. At a trade show,, everyone ends up with a pile of business cards and flyers, some crappy tote bags, and, if you’re lucky, a flash drive you can erase and use for yourself. And aside from the flash drive, it all goes in the garbage. But when people see a photobooth, they actually want to get their picture taken, and they’ll take it home with them. This brings them into your space and engages them immediately. 4- Photobooths capture emails. All our photobooths at A Flying Camera’s San Francisco location have touch screens that prompt the user to enter their email address to get a digital copy of the picture (of course they get an immediate print too!). At the end of your event ,you’ll have access to that email list so you can contact potential new clients. 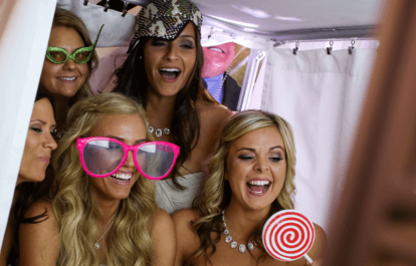 For these reasons and more, a photobooth is a great addition to any corporate event or party. As we are based in the Bay Area, we have a long history of working with major companies, from tech startups to some of San Francisco’s greatest success stories. Companies that have rented a photobooth from us for their corporate events include Instagram, Apple, Google, Facebook, Whole Foods, the PGA, the Golden State Warriors, Paypal, Adobe, AT&T and the San Francisco Giants. Did we mention Instagram? They know a thing or two about photos, and they rent photoboooths from us.